FRESNO, Calif. (KFSN) -- As if one legendary rock band isn't cool enough, last weekend Fresno was blessed with a double celebrity musical appearance. At Metallica's performance at the Save Mart Center on Sunday night, among the throng of Central Valley fans rocking out to the heavy metal band was rapper Post Malone. Apparently, the admiration was mutual. After the show, Metallica lead guitarist Kirk Hammett posted a photo of the two backstage with the caption, "They call him @PostMalone. 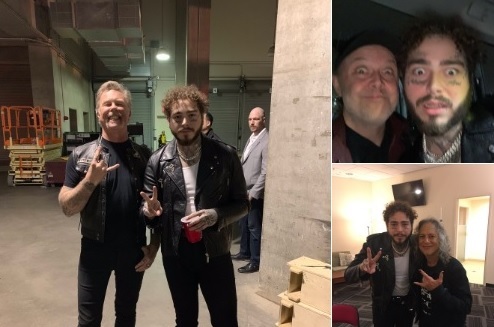 Hope you enjoyed the show man #MetInFresno "
Not long after that, Post Malone tweeted out the picture with Hammett, along with a selfie with an intense Lars Ulrich, Metallica's drummer, and a photo with a grinning James Hetfield, the lead vocalist. According to reports, audience members at the Metallica show spotted singer-songwriter-rapper Post Malone and his distinctive tattoos and couldn't resist clicking pictures with him as well.